Labyrinths are rare and valuable archaeological monuments. Approximately 300 have been preserved in the world. The 13 – 14 Bolshoi Zayatsky Island stone labyrinths belong to the best preserved ones. These labyrinths are made of stones which have been laid on the surface of soil. Bolshoi Zayatsky Island is a small island (1.25 km2), belonging to the group of Solovetsky Islands. It is covered with boulders, moss and large bushes. This small island has got 13 or 14 labyrinths as well as more than 850 heaps of boulders and numerous other stone settings (e.g. a unique stone Sun with radial spokes). 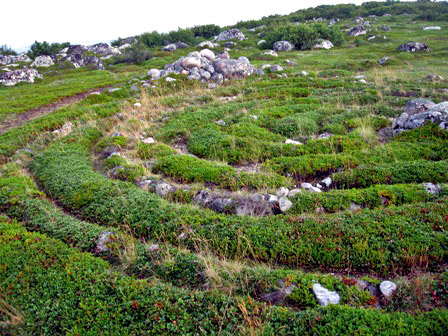 In total there are 35 labyrinths, or as locals call them – “vavilons” in the Solovetsky Islands. All the stone settings have been made of local boulders. Excavations in the stone heaps have yielded parts of bones (4.). All the labyrinths are concentrated in an area of 0.4 km2 on the western part of the island. In the eastern part of the island (Sopka Hill) there is another enormous complex of stone settings which does not include any labyrinths. Besides the labyrinths there are numerous other stone settings in islands. The diameter of the labyrinths on the island is between 6 and 25.4 metres. Labyrinths for the most part are formed by boulders set in a row. The boulders are not especially large (roughly 30 – 40 cm in diameter). The rows are twisted in the form of a spiral; often there are two spirals set one into another, as if two serpents with their heads in the middle looking at each other. Along the spiral there are intermittent thicker/ wider heaps of stones and the ends of the spirals are widened as well. The entrances are located in the southern part of the labyrinths, but sometimes these entrances can also be found in the south-western, eastern and western parts. Although the labyrinths have five types of settings, each of them has got one entrance which also serves as an exit. It has been suggested that they can symbolise a border between our world and the underworld. The purpose of these stone settings is unclear. It may be assumed that the labyrinth was used for specific rituals to help the souls of deceased travel to another world. Another hypothesis is that the stone settings served as a model for complex fishing equipment. Labyrinths are located on nearby islands as well: on Bolshoy Solovetsky (near Kislaya Guba) and on Anzersky (eastern end near Kalguyev spit). There are, or existed at an earlier date, labyrinths at the mouths of the rivers of the White Sea – Umba, Verzuga, Kem, Ponoi. These petroforms always are located within sight of the sea. Виноградов Н. Новые лабиринты Соловецкого архиппелага. Лабиринты Б. Заяцкого острова // Материалы СОК. Вып. 12. Соловки,1927. С, 14-30. 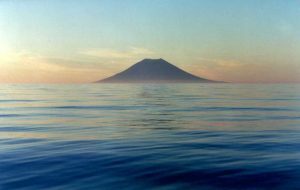 Age: 2000 – 3000 BC ? The largest country in the world, Russia, is associated in the minds of many people with the onion domes of Orthodox churches and the massive walls of the Moscow Kremlin. But besides the unique architecture, Russia offers many more unusual and exciting attractions. One of the most fascinating groups of archaeological monuments are prehistoric structures made of large stones – megaliths. Through the ages, people have loved to strain their minds to find a sensible explanation to the many riddles posed by these landmarks. Megalithic monuments are among the most striking remains of the Neolithic period of northern and western Europe and are scattered across landscapes from Pomerania to Portugal. Antiquarians and archaeologists early recognized the family resemblance of the different groups of tombs, attributing them to maritime peoples moving along the western seaways. “Magic Stones” documents, in stunning and evocative photographs, our ancestors’ obsession with stone. 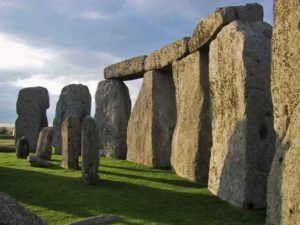 Throughout Europe stone has been used to create dwellings for the living and the dead, as a canvas for our earliest art, to celebrate the heavens and in ways that are still, even today, beyond our understanding.